Schmid, M.S., Aubry, C., Grigor, J., Fortier, L.
ZOOMIE can automatically filter thousands of images based on previously extracted image parameters (e.g. area, mean grey pixel value, kurtosis; here extracted using the LOKI browser software (Isitec GmbH; http://www.isitec.de/start.htm)). The filtering is based on a set of rules that compares the image parameters of multiple images in order to detect double images and exclude them. The set of rules can be changed easily in the ZOOMIE scripts so that researchers can easily adapt the thresholds for finding double images necessary for their LOKI settings. After running the actual script to find double images, other scripts can be executed to automatically transfer images flagged for exclusion to a new folder. Finally, the results can be visualized on an internal homepage, using the actual images which are linked to the database. Here we can validate the outcome of the processing and we can manually adapt the outcome through dragging and dropping of images to verify if any images were wrongly allocated to a double image group. Although ZOOMIE was developed for LOKI images and the exclusion of double images, ZOOMIE could easily be adapted to handle other tasks requiring the handling and comparison of large numbers of images. Climate change is negatively affecting tropical regions through increasing temperatures and decreased precipitation leading to changes in local hydrology and decreasing water supply among others. In order to make accurate future predictions of carbon stock and forest health it is necessary to better understand the current underlying baseline carbon stock and how it may vary across space. Here we adapted an existing carbon stock assessment method and applied it to two tropical regions in Nicaragua and Costa Rica managed by the Maderas Rainforest Conservancy. Carbon stock was calculated based on 1) above-ground tree biomass, 2) above-ground sapling biomass, 3) leaf litter, herb and grass biomass, 4) soil organic carbon, 5) below-ground biomass, 6) stumps and deadwood and 7) regenerating plants. Our results show a strata-pooled average of 234.09 ± 379 Mg C ha-1 (n=40) carbon at the Costa Rican site and 209.20 ± 216 Mg C ha-1 (n=40) at the Nicaraguan site. These values are much higher than those available on a biome-wide scale, highlighting the extent of carbon stock loss outside these study areas as a result of anthropogenic disturbances, in comparison to more pristine areas. Local investigations into carbon stocks in the tropics are necessary to better estimate the current state of carbon content in the tropics. By adapting existing sampling protocols to local conditions this can be achieved efficiently. Furthermore, local estimates of carbon stock enable non-governmental organizations (NGOs) to participate in the Reducing Emissions from Deforestation and forest Degradation (REDD) program led by the United Nations. still represent a land of opportunity (a “lebensraum”; Figs. 1.2 and 1.3)…..
Huettmann, F and Schmid, M.S. 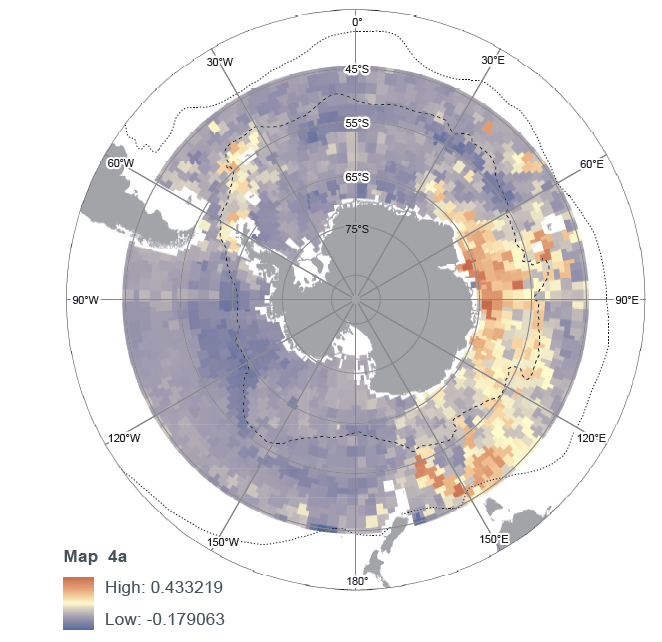 (2014) Publicly available open access data and machine learning model-predictions applied with open source Geographic Information Systems (GIS) for the entire Antarctic Ocean: A first meta-analysis and synthesis from 53 charismatic species. In: Benjamin Veress and Jozsi Szigethy (eds). Horizons in Earth Science Research. Volume 11, Nova Science Publishers, New York Pages, pp. 23-33. In: B. Slat (ed.) How the Oceans can clean themselves. A feasibility study. The Ocean Cleanup, Delft, pp. 320-327. The common raven (Corvus corax) is an abundant generalist of the northern hemisphere, known to congregate and roost near human-related food sources. Due to a growing human-footprint and associated anthropogenic food subsidies, raven populations have increased dramatically over the past several years throughout the USA. The sub-arctic region has also witnessed increased urbanization and industrialization, and ravens have taken advantage of these changes. During 2004 and 2006, we surveyed parking lots on a bi-weekly basis in the city of Fairbanks in interior Alaska, showing an influx of ravens in winter. Between 2010 and 2012, we documented the presence and absence of ravens at a permanent set of 30 suspected raven locations and 21 randomized locations within the city limits of Fairbanks. We used machine learning (RandomForests) and 12 spatial GIS datasets from the Fairbanks North Star Borough to accurately model-predict the relative occurrence of ravens during winter and summer in Fairbanks. Our research showed a positive correlation between raven occurrence and commercial and residential zones in both winter and summer, as well as an inverse geographic relationship between ravens and the waste transfer station in the study area in winter, and a direct correlation near restaurants in summer. These results emphasize the link that ravens have with commercial, anthropogenic food sources, and how Fairbanks and its subsidized, urban habitat may be shaping part of the wider sub-arctic biodiversity landscape. Data includes for instance mixed layer depths, phytoplankton fluorescence, as well as predicted plankton distributions.